V0751. 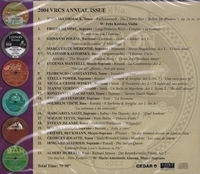 VOCAL RECORD COLLECTORS' SOCIETY � 2004 Issue, incl. Stella Power, Hempel, Polese, M�renti�, Kastorsky, Mantelli, Constantino (Unpublished), Geisse-Winkel, Jeanne Gordon, Isachenko, Bettendorf, Tisch, Salvi, Beckmann, L�szl�, McCormack (Unpublished �Take�), Teyte (Unpublished), Island�, Jouatte, Huberty & Irmgard Seefried (the latter a broadcast performance). VRCS-2004. Transfers by Seth B. Winner.